Hi Everyone! 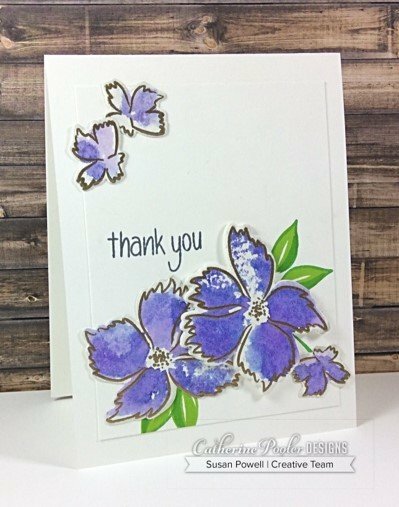 Susan here sharing a card featuring the new Wonderful Wildflowers stamps and dies and the new Grape Crush ink from the Wild & Wonderful Release. 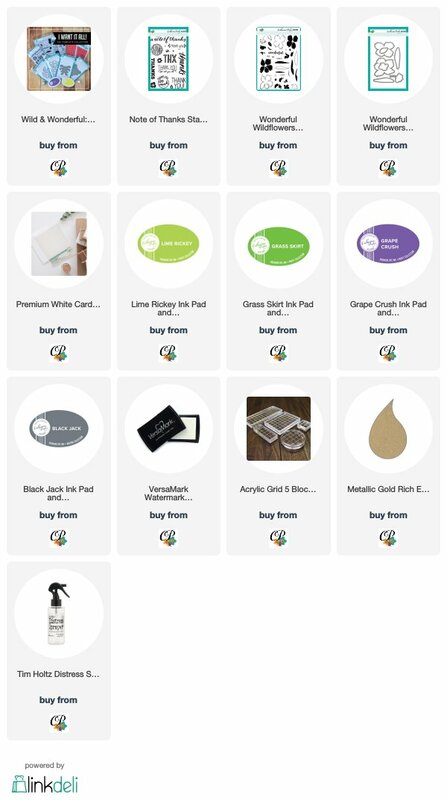 I've never been a fan of purple but with this new Grape Crush ink color I've changed my mind! I smooshed the ink pad onto my craft mat and spritzed it a few times with water. I used the ‘pool' of watered down purple ink as my ink pad and stamped the flowers onto water color paper. I stamped the outline stamp and the flower center with Versamark ink and then heat embossed it with gold embossing powder. I used the coordinating dies to cut each one out. The leaves are stamped directly onto the card panel with Lime Rickey and Grass Skirt and the flowers are adhered to the panel. I popped the large flower on the right up on craft foam for some dimension. I love the different shades of purple that appear when stamping this way. The sentiment, from the A Note Of Thanks stamp set, was stamped with Black Jack ink.